Get your free design and quote today! Please visit BKGDesign.com to see the latest pictures and prices. Budget Kitchen and Bath is Pittsburgh’s premier place to buy a new kitchen and or bathroom. 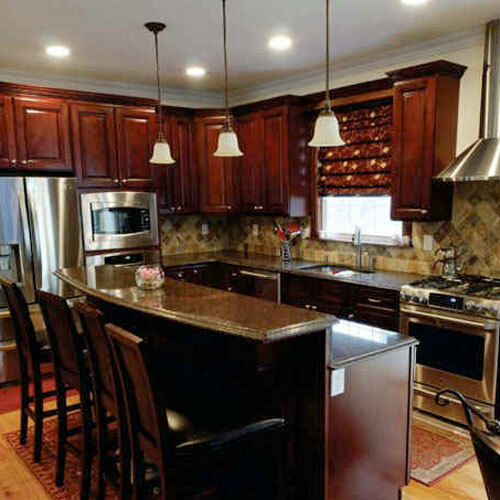 With over 30 years experience, allow us to be in charge of your next Pittsburgh kitchen remodeling project. Our designers will take your ideas and develop a virtual reality drawing of your own dream kitchen. Our showroom is conveniently located in Pittsburgh's South Hills. We pride ourselves in providing our customers with the absolute best products on the market. We offer all wood cabinetry in over 100 different colors and styles, for your Pittsburgh kitchen remodeling projects. There is absolutely NO particle board in any of our cabinets. Our cabinets feature full extension easy close drawer systems. We also have dovetail drawer boxes available as well as soft close door hinges. We carry complete cabinet lines to fulfill all your kitchen and bathroom remodeling needs. You can choose from a variety of cabinetry option such as; lazy susans, corner cabinets, pantries, plate racks, wine racks, glass doors a variety of crown moldings. Our wall cabinets are available in different heights such as 12“, 15“, 18“, 24“,30“, 36” and 42”. Our base cabinets are available in“, 12“,15“,18“,21“,24“,27“ ,30“,36”with some larger sizes available. If these do not fit your needs simply ask about our semi custom cabinet lines. Please stop in to our showroom today so we can help make your kitchen remodeling dreams a reality. We would love the opportunity to earn your business!